Occlusion and bypass is a two part procedure combining open microsurgery and endovascular coiling. The purpose of this procedure is to coil the entire diseased portion of the blood vessel and then bypass the blood flow to the specific location in the brain. This procedure closes down the whole blood vessel rather than just putting coils in the aneurysm sac like the endovascular coiling treatment method. When the blood flow through the artery leading to the brain aneurysm is stopped an occlusion occurs. In some cases, it may be best to stop blood flow through the artery leading to the brain aneurysm. This is known as an occlusion. Sometimes the aneurysm has caused severe damage to the artery, so the doctor must go in and completely shut down that part of the artery and reroute the blood. This procedure is usually done as an open surgery, which requires similar surgical preparation as in a clipping procedure such as having your head shaved, and a section of the bone plate removed. HOW IS OCCLUSION AND BYPASS PERFORMED? Bypass, the first part of the procedure, is an open microsurgical technique performed to use blood vessels as mediums to flow blood from one part of the brain into another. A previously identified donor vessel is separated from one end of its normal location and rerouted into the brain at a position beyond the aneurysm. The donor vessel is then reconnected to the parent vessel to ensure that blood continues to flow to the part of the brain that needs to receive it. After the blood vessel has been bypassed, the next step is to occlude (close) the diseased portion of the blood vessel containing the aneurysm using an endovascular technique called coiling. To close down the diseased vessel, coils are inserted into the vessel until it is completely filled. These coils will permanently remain inside the brain. Artery occlusion and bypass is often used to treat aneurysms that cannot be closed with standard methods. The first type uses a vessel graft – a length of artery or vein harvested from somewhere else in the body. The graft is connected above and below the blocked artery so that blood flow is bypassed (rerouted) through the graft. Common vessels used as a graft are the saphenous vein in the leg or the radial or ulnar arteries in the arm. A separate incision is required to harvest the graft. Next, one end of the graft is connected to the external carotid artery (ECA) in the neck and then tunneled under the skin in front of the ear to the scalp. A hole is cut in the skull through which the graft is passed and connected to an artery in the brain. This method is typically used when a large (high-flow) artery is affected or needs to be sacrificed to treat the aneurysm. The other type does not use a vessel graft but a healthy donor artery that flows in the scalp or face. 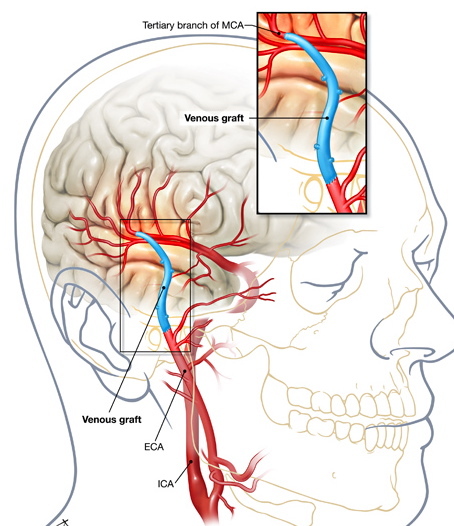 The donor artery is detached from its normal position on one end, redirected to the inside of the skull, and connected to an artery on the surface of the brain. The scalp artery now supplies blood to the brain and bypasses the blocked or damaged vessel. This method is typically used when a smaller (low-flow) artery has narrowed and is not capable of delivering enough blood to the brain. Moyamoya disease: a narrowing of the internal carotid arteries at the base of the brain that can cause multiple strokes or hemorrhages. To compensate for the narrowing arteries, the brain creates collateral blood vessels in an attempt to deliver oxygen-rich blood to deprived areas of the brain. A bypass can restore blood flow to the brain and prevent future strokes. Aneurysm: a bulge or ballooning of an artery wall. Some giant, fusiform, or dissecting aneurysms cannot be treated with surgical clipping or endovascular coiling. In such cases, the parent artery must be sacrificed and the blood flow bypassed for the aneurysm to be effectively treated. Skull base tumor: a tumor can grow where the major vessels enter the skull and surround or invade the artery. Removing the tumor may require sacrificing the encased artery and bypassing the blood flow. Carotid artery stenosis or occlusion: a narrowing or blockage of the carotid artery in the neck caused by atherosclerotic plaque deposits in the vessel wall. Intracranial arterial stenosis: a narrowing or blockage of an artery inside the skull that supplies blood to specific areas within the brain.